Among the dinner rolls and the stuffing that’s typically found on a traditional Thanksgiving table, you’ll typically find an enticing sweet potato casserole. This sweet potato casserole recipe is a lightened up, low-sugar, gluten-free version that you can serve right alongside your other favorite holiday dishes. 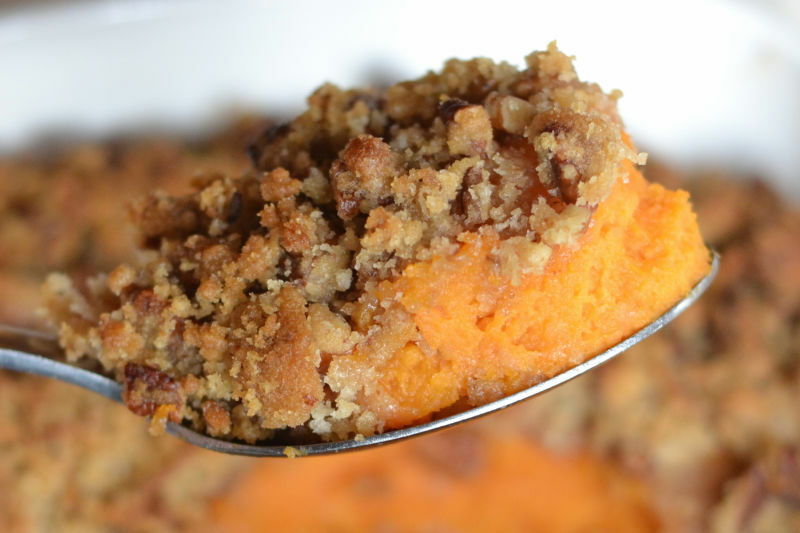 Traditionally, a sweet potato casserole is sweetened with granulated sugar then topped with a crunchy brown sugar-pecan crumble. Because sweet potatoes are naturally sweet, however, we think a sweet potato casserole can be just as yummy without all the added sugar. Instead, this sweet potato casserole recipe relies on the natural sweetness of the sweet potatoes and a mix of fall spices to give the dish lots of irresistible flavor and appeal. There’s absolutely no added sugar in this recipe, but if you really felt inclined to increase the level of sweetness in this recipe, you can add a natural sweetener like maple syrup to the potatoes to accomplish that. Making this sweet potato casserole recipe can take a little longer due to the nature of sweet potatoes themselves and how long it takes to cook them tender. The upside, however, is that this recipe can easily be prepped in advance and reheated before you’re ready to serve your holiday dinner. Preheat the oven to 400°F. Place the sweet potatoes on a baking sheet lined with foil and pierce each sweet potato several times with a sharp knife. Roast the sweet potatoes for 45 minutes to 1 hour, until they're tender and soft. Let the sweet potatoes cool, then cut them open and scrape out the flesh into the bowl of a food processor or blender. Add the coconut milk, 1 tablespoon of coconut oil, 1 teaspoon of ground cinnamon, the nutmeg, 1 teaspoon of salt, and the black pepper. Blend until smooth and combined. Taste test for more seasoning or salt, and once the flavor is okay, add the egg and blend again to combine. Spread the sweet potato mixture into a baking dish and temporarily set aside. Lower the oven temperature to 375°F. Create the topping for the casserole by pulsing 1 cup of the pecans in a food processor until it's in a fine, powder-like form. Add the teaspoon of cinnamon, pinch of salt, and 1 tablespoon of coconut oil. Process the mixture until everything is combined, then use a spoon to stir in the rest of the pecan pieces. Pour the topping all over the sweet potato mixture in the baking pan, then bake the casserole until the top begins to brown (about 10 to 20 minutes).